He’s home! The TV is officially back on 24/7 and only playing animation or scifi. But its good to have him back. The added bonus is that he brought an old school friend of mine with him who we’ve not seen in ages. It turns out that amongst her many other skills she makes a mean cocktail. We started on sparkling rosé, then a jug of Mojitos, French 75s and Tom Collins’s. It does occur to me that there aren’t any scifi themed cocktails. There must be some recipes somewhere – ‘blue milk’ perhaps? 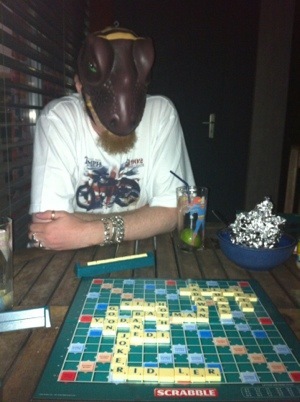 We had a BBQ with our cocktails and decided to play scrabble, with the addition of a new rule – all words must relate to scifi. Weirdly this worked quite well but was perhaps a little messy.